Great to meet a Sporty family. When i was little i had Asthma too ,but i have grown over it. I had to laugh at your laundry comment. My kids are a bit younger, but holy crap I am so tired of so many more loads! Forget about packing, ugh! It is really nice to meet you! Oh I can relate to soccer mom status! Both my kids play travel and my son also played varsity this year as a freshman at his high school. It was a great experience for him and I have to admit–I do love to watch both kids play! It’s a beautiful game and one I have come to appreciate spectating. Good for you for only having to lay off three times in all these years–that’s quite an accomplishment! Here’s to hoping you wont’ have to face ice any time soon. Great to get to know you! So cool that you coach soccer that must be so much fun! I so wish I was a math nerd. math is so painful for me! I was always so envious of people who just got it in math class! Yikes your fall sounds scary! How impressive is that comeback and PR though!? Winter running does make for lots of laundry doesn’t it? My kids are older and I am a lacrosse mom-boys have never ending laundry and appetites too! Enjoying connecting with you in the blog hop! We have our own laundry baskets too. Smelly clothes baskets are open too so that the stink can air out a bit. Yes, I teach math. It’s lots of fun firing up those brain cells. Hi, I’m coming from the hop. I’m a water skier, and I couldn’t understand why I couldn’t get any of my three sons interested. They are just different people than their parents, I guess. I did influence my oldest to run – so that made me heart swell. It’s wonderful you are coaching your son’s soccer team. Layoffs are difficult. I’m currently wrapping one up. Congratulations for BQing after coming back from your injury. That’s incredible. I live in the south, so most of my runs are extremely hot and humid — so I appreciate a cold run. Nice to meet you! I had asthma when I was younger, but thankfully grew out of it. I can’t imagine trying to be a runner while still dealing with it. It was enough of an obstacle when I dealt with it in middle school and high school. Awe! You coach your boys soccer teams? What an awesome way to share your love of fitness with them. I love that you didn’t force anything on them, you let them find what they wanted to do! That’s what my parents did and I truly think it’s the best way to do it. I’m sorry to hear about your jaw – that must have been AWFUL! Your running journey is inspiring and I am so glad to have connected with you through the blog hop! I look forward to getting to know you even better! Thanks, Rachel. I love coaching; the boys are wonderful and I’m hoping to have a few of them on my team next season. Who am I kidding? I’d take the whole team again. Hilarious story about your boys become soccer afficionados. Kids have their own personalities, don’t they? They either love something or they don’t and it’s really good of you and your husband not to force them. But things always work out in he end, I like to say. Sorry to hear about your injuries last year. Be careful out there! The really odd thing is my boys have opposite personalities but they both really enjoy the game. Hi from the blog hop! That fall sounds so scary! I guess living in Florida I don’t worry about the cold much or running in those conditions! 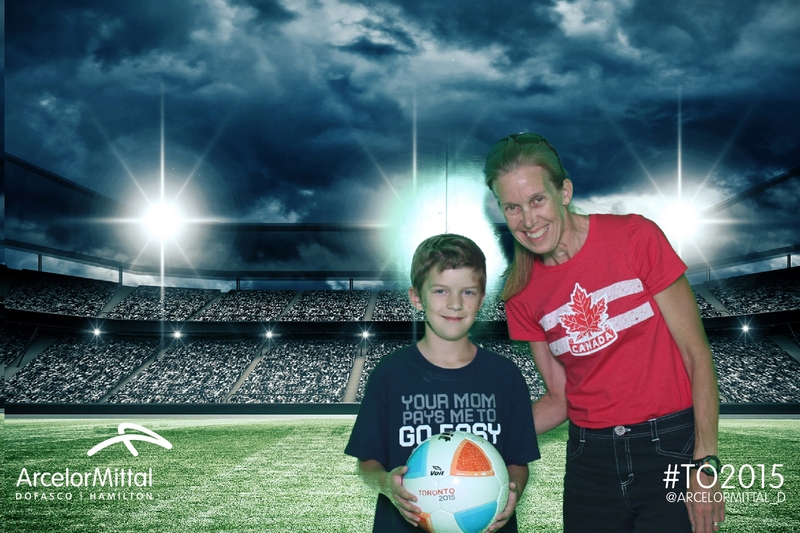 I coached soccer one year when my son was little- fun experience! Enjoy it! Lucky you, living in warm weather. I look at it from a bright side: cold weather means more clothes so I have an excuse to shop. Hi from the Blog Hop!! I too have become a soccer mom as well as a gymnastics mom. Neither of my kids chose football which is so surprising to me since they have been around it since they were conceived-lol! My son now comes home and want to watch soccer and critiques the players-it is really cute. He plays on a U9 team. OMG-I am so sorry to hear about your fall and your parents. I am so petrified of running in the winter and slipping. I don’t have an indoor option so often had to brave the weather and the elements last year when training for my Spring half. Congrats 8k title winner and BQ qualifier.-that is so awesome!! Good for you managing your asthma and not letting it get the best of you! The never ending loads of laundry!!! For out fit, active sports family-I swear I need to hire someone to do all of our laundry! I never get a hold of it! The one advantage of our laundry, though, is the athletic fabrics are hung dry. I am saving a bundle of our dryer bill. True!! I need to do better at hang drying! It’s so great how your love of running forced you to figure out your asthma and what an athlete you are! Congrats on BQ, your 8K title, and all the other running accomplishments you have made. My jaw hurts just reading the above. Sorry to hear about your parents’ passing. I cannot imagine. BTW, I was totally there with you during Richard Simmons craze although I was all about Jane Fonda’s workout videos and then onto Denise Austin. It’s cool that your boys found soccer (I say that because I love soccer)! Enjoy your coaching career Soccer Mom! Oh wow, I love your story! So many people with Asthma allow it to control them and let it limit them to what they can do and accomplish and I am sure everyones case is different. But you are a shinning example of what you can do if you work hard at moving through any obstacle life throws your way. I am seriously, and I mean seriously impressed with your running. 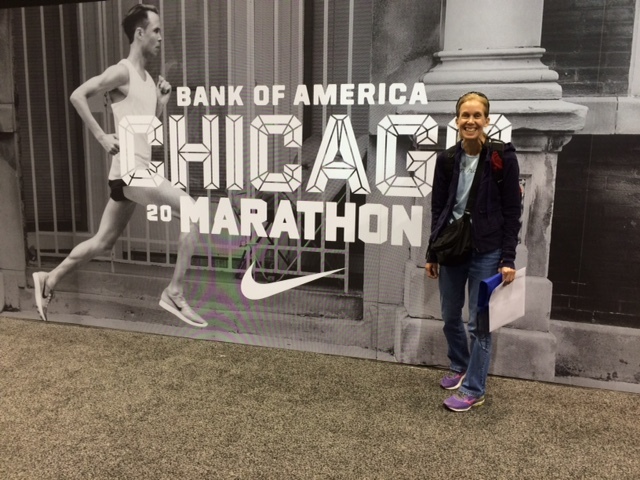 BQ at Chicago? That is such a huge race, and I hear one of the harder ones to BQ in because of it, so I am just all sorts of jealously amazed! 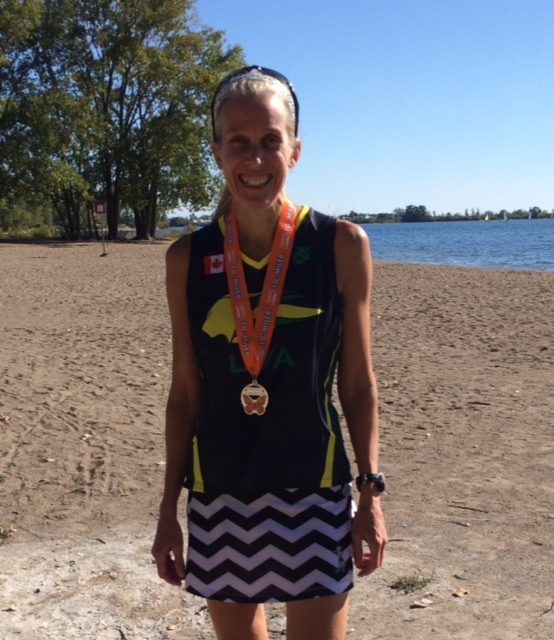 A Canadian Masters, wow I bet your an awesome person to just sit and chat running with! I also loved the story about how you introduced and active life and the sport of soccer into your kids life. I love parents like you guys are! When I was younger, my dad was a really good marathon runner and every day he would come home from work, change and go for a run. Once or twice a week if we wanted he would let us ride our bikes along with him (if we promised to stay out of traffic and keep up, LOL) It’s those moments that actually taught me to love the sport of running at a young age and keep up with it into my adult life. I have a feeling you’ll and are passing down some incredibly great habits and a totally awesome life onto your children!!! Really enjoyed getting to know you better today! I love that you coach their team! My dad was always the coach of basically every time from softball to soccer to basketball that my sisters and I played on when we were younger – except cheerleading, he was NOT my cheerleading coach ahahah. I always loved that growing it. It was such a great bond! Keep setting that amazing example for them. It is clearly catching on and that is absolutely fantastic for kids today. 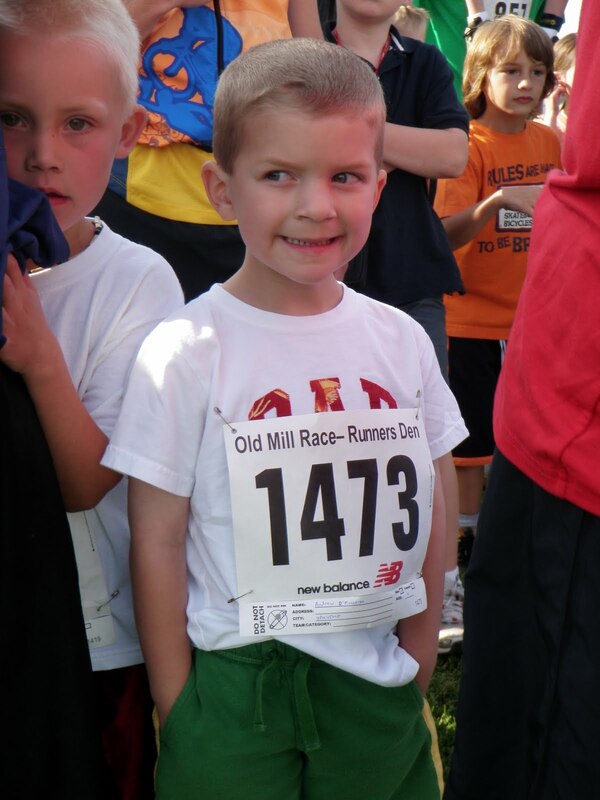 I hope my son wants to run with me, too! He’s 3.5 and has started asking to come along :). I’m also lactose intolerant, but I take lactaid pills…I don’t adjust my diet TOO much, but I also am not the biggest chocolate fan (gasp!). I’m impressed that you’re able to keep up with your running in the winter in such a cold climate – I’m much more of a California wimp :). Nice meeting you via the hop! wow! Congrats on your Masters Elite status!!! And best wishes in Boston 😉 I’m not a math teacher, but am a bit of a math nerd. I seldom use my GPS watch to gauge my pace,but instead use good old-fashioned math to calculate my (approximate) pace at the mile marks during races. Truth. And your jaw injury…Holy Ouch! That must have been pretty scary. I can definitely relate to lots of things in your post, most notably your injury this year and your asthma. So cool that your boys have discovered soccer! I went to my first pro soccer game two years ago (in Italy, no less) and came away with a whole new appreciation of the sport. Coming from the blog hop and so nice to connect with you. I live in Mississippi and girl let me tell you, you could get all the hot and sweaty runs you want 10 months out of the year! You have my utter respect for a BQ in Chicago my friend! Great to meet you! Love that you’re a soccer coach! My father was a soccer player and coach so I grew up with the sport as a kid. Your accident with the ice was scary! That’s the reason I can not run in cold weather climates. I’m clumsy enough as it is and add to that factors like ice and I’d probably end up with a broken jaw too. So glad you’re better! I’m not surprised you are careful on the ice after your fall. Having to stop running whilst you recovered must have been had. I’m vegan so I know what you mean about only being able to eat your own (chocolate) cakes! It’s great your two boys have found an activity they love. The biggest challenge that I am facing is not the ice but running in the dark. I’ve been out a few times at night and, today, did my first solo tempo in the dark. It was a bit slower because I am just that much more cautious of where my feet are landing. Love, love your story! So cool that you are able to manage your asthma! I have actually been following your running story for quite some time….before I even got into blogging myself! I love that you coach soccer…how fun!! My dad was our soccer coach growing up and it was alot of fun! I hope my girls get into it some day but if not, that’s cool! Thanks, Lauren. One of the great things about managing my own asthma is it has helped me be a better coach (cross-country and track) at school because I can work with asthmatic kids and teach them that they can still run. Yikes Cyn, I can definitely understand why you’d be reticent to run this winter. Do you have YakTrax? Nevertheless, it’s impressive you’ve only had 3 breaks from running over all these years. I’m glad your boys found a sport they love! Yes, I have Yaks but they are only good in certain conditions. I wouldn’t wear them if the roads are dry. It’s the odd patch of ice – and dark – that are the worry. oh man, that accident sounds awful, I’m so sorry to hear but definitely glad you are on the mend!! 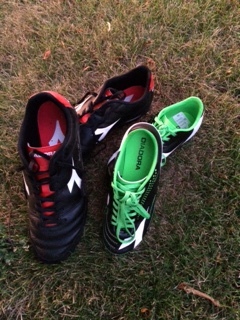 Love that story about your boys and how you’ve become a soccer family! Congrats on your BQ in Chicago! That’s an amazing accomplishment. Running hasn’t been kind to my feet either. I do my own foot soaks and creams ’cause I’m too embarrassed to get a pedicure. You’re right about summer laundry -vs- winter laundry. I prefer the hot over cold. Anything below 50 is cold for me. Great post! I love that you used your name to tell us more about you. I just learned so much! I’m so sorry to hear about your broken jaw. I live in Alaska so slippery runs are the norm and I’m going to be very careful from now on! Omg, slipping on ice has become a bit of a phobia of mine, and I got goosebumps reading about your injury. Phobia reinforced!! haha. I ran through the Winter in Montreal last year, but actually signed up to a gym yesterday because the thought of running on ice for another season got too much :). Great intro post, will be back! How exciting your sons have found their niche in athletics! I’m glad. My boyfriend is quite an athlete both physically and mentally himself and he always says how our kids will be all-stars at every sport. Of course I laugh because kids sometimes aren’t always in to what their parents are or want them to be. But I hope that they do find a sport, I was never exposed to sports as a child and as I grew older I avoided them because I always felt so uncoordinated to be able to do them. I had LOW SKILLS in pretty much everything! Even in running, and I probably still do. But I love fitness because you can always work hard to improve. I wish I had been exposed to sports, because I feel like playing on a team and challenging your physical skills really gives you some important exposure and life lessons. I’m glad you found a way to cope with your asthma and I’m hoping for a safe winter training for you! Happy to meet you in the blog hop, and I too hate the cold! Firstly, sorry for my late arrival at your blog! Excuses, excuses. But I love your writing! That fall sounds absolutely horrendous. I’ve only fallen once (involving some frost, a branch, and my running buddy), but the only injuries were a bruised hip and a scraped glove (and thankfully not my hand!). I did a bit of winter running in my hometown of Barrie, Ontario in minus 18 and a lot of snow…and that’s why I live in Vancouver! I’m so sorry to hear about the loss of your parents. I lost my mom in 2013 and it was a really tough time. Virtual hugs to you. Thanks for sharing. I look forward to reading more from you! Thanks, Bradley. I use to live in Vancouver and would love to move back. The last time I was there was our honeymoon (that’s how much I like Van; it was the only place I wanted to go.). I missed the boat for Seawheeze – need a runcation to drive me back. Yes, the fall was nasty. I was on liquids for a month, and then soft foods were introduced. Fortunately, I only lost a few pounds (but I missed them!). 2016 is my comeback year, starting with an 8k at the end of January. We stay busy with ballet and swim right now! I can’t imagine adding much more to the schedule with work commitments. I just don’t have the energy. Also, ice absolutely terrifies me. How scary to your fall resulted in a broken jaw. Fingers crossed for a mild winter this year! I always thought things would get easier as my kids got older but it is actually tougher. I am also being given some lead roles at school so work has me busier too. Positive stress wins all the time. I can not tell you how much I enjoyed this blog post. Not only do I already think your pretty cool, but I mean you love chocolate! Joking. I love when mom’s encourage their kids to shine on their own. I have 3 kids all of which are very different on sports, fitness, and running interest. I have a 14 year old son who loves running and is great at it, but tries to fit in with the football/cool kids. So pretty much the only time he does what he really loves is if I force him to come! I see him light up and smile on runs and I wish he would become serious about it. He has mentioned wanting to run cross country, I hope he does. He has run a 10K and a kid triathlon when he was 12. My 12yr daughter has asthma and struggles running, but we monitor her breathing and help her pace. She is has run up to a 5K so far. She doesn’t really like running, she is more of a surfer, couch surfer that is. But she has shown interest in yoga and volleyball. My Bitty girl loves to run, play soccer, and gymnastics! She is my fearless one! I couldn’t have 3 more different kids. I was considering coaching this year! Do you like it? I wish I could run and be competitive, but my body just hates running, though my heart loves it. I find you so inspirational. I am so glad to cyber know you! Thanks, Carleeh. I am asthmatic and worked to be able to run with it. I have done the same with kids at school who have asthma and want to run. If your daughter has any questions, fire away. I love that your kids are so active. Once your middle child grows into her asthma, she’ll find cardio-based sports easier and will be able to enjoy them. Next Next post: Do You See What I See?